Learn more about how to implement the Three Phases of Blended Learning from other educators and coaches that are working in a Phase 1, Phase 2, or Phase 3 learning environment. Join today by clicking here. 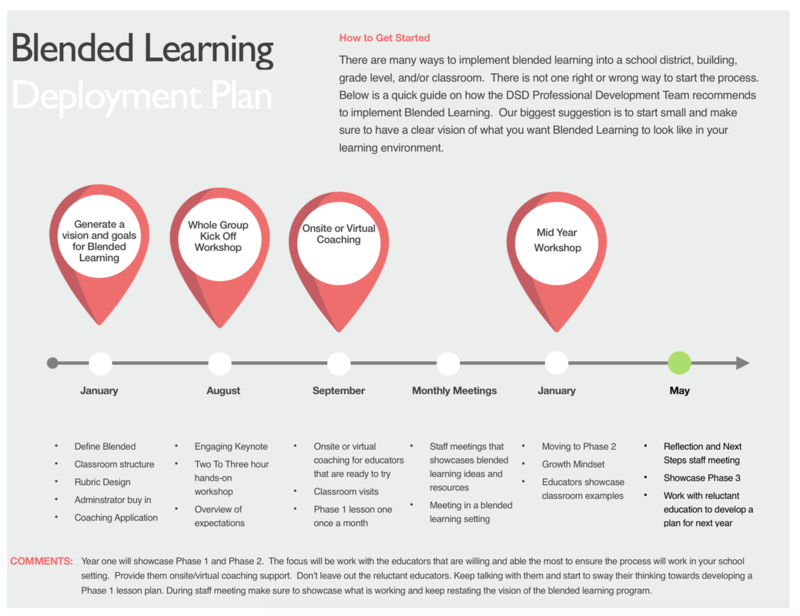 What are the Three Phases of Blended Learning? The Three Phases of Blended Learning were designed and created by Marcia Kish. As a blended learning coach, Marcia realized that a gradual release program works best when transforming the traditional classroom into the right blended learning environment. 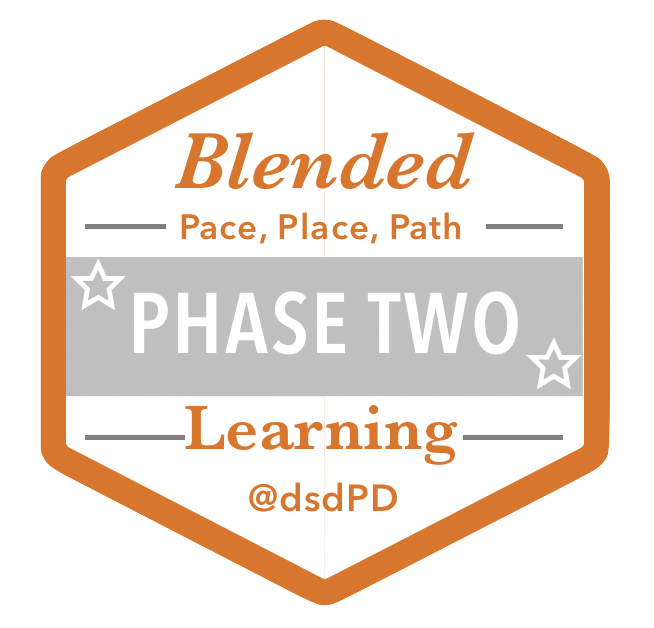 The Three Phases of Blended Learning explores ten key elements that we look for in the classroom setting. The ten components include the use of data and assessment, allowing students to work at their own pace, place, and path, the use of digital content, student engagement, and the role of the teacher. The teacher can move through the continuum at her own pace and flow between Phase One, Phase Two, and Phase Three depending on the nature of the lesson provided to the students. The DSD Professional Development team is striving towards expanding future ready classroom environments through the implementation of personalized learning where the learners take ownership of their learning. With the implementation of the six-phase rollout process, classroom teachers can gradually work towards designing a learning space that personalizes the education for each student. Phase 1 - Explores how to transition into a future-ready classroom setting by redesigning the space, breaking the lesson into four parts: mini-lesson, independent practice, digital content, and future-ready skills, and starts to implement personalized adaptive technology software programs that mimic the mini-lesson topics. Phase 2 - Shifts the idea of teaching the same thing to all students to differentiating instruction by exploring the data to drive the mini-lessons, and focusing on the skills that the individual learner is ready to learn through independent practice and adaptive technology. The future-ready skills start to allow for choice and voice in projects that promote creativity, collaboration, communication, critical thinking, and connectedness. ​Phase 3 - Constructs learning targets that will showcase the implementation of project-based learning, 20% Time, or Genius Hour projects. The teacher provides learning opportunities throughout the week, unit, semester for the students to work on the projects during the future ready skills activities and the ongoing personalized learning checklist. Phase 4 - Deploys a partnership between the facilitator and the learner where together they explore the standards to determine learning targets that match up with the common core standards. Together they look at the data collected from the adaptive online programs, formative assessments, and high stake test to determine a personalized learning path while working on the future ready passion projects. Phase 5 - Releases a majority of the decision making to the learning through owner voice, choice, and ownership. The facilitator acts as a project manager and provides mini-lessons on topics when the student is ready to learn a new concept or needs support with the passion project objectives. The start of the developing a personalized learning network with community members tends to drive the focus and strategies of the phase 5 deployment process. Phase 6 - The learners create a business, a product, or a system that will provide a solution to help the community for the greater good with a tie into the passion projects. The personalized learning network and future-ready skills will be combined with the previous five phases to ensure the successful implementation of the product.